The SEC’s Office of Investor Education and Advocacy is issuing this Investor Alert to warn investors that fraudsters may conduct investment schemes through purported online binary options trading platforms. While some binary options are listed on registered exchanges or traded on a designated contract market that are subject to oversight by U.S. regulators such as the SEC or the Commodity Futures Trading Commission, respectively, this is only a portion of the binary options market. Much of the binary options market operates through Internet-based trading platforms that are not necessarily complying with applicable U.S. regulatory requirements. For a comprehensive overview of binary options, including information about investing in binary options that are subject to U.S. regulatory oversight, read our Investor Alert: Binary Options and Fraud. Typically, a representative of a binary options website will ask a customer to deposit money into an account where the customer can purchase binary options contracts. A customer may be asked to, for example, pay $50 for a binary option contract that promises a 50% return if the stock price of XYZ company is above $5 per share when the binary option expires. Representatives of binary options websites may use fictitious names and tout fake credentials, qualifications, and experience. They may misrepresent where they are calling from (for example, pretending that they are in the U.S.). Supposedly “unbiased” sources reviewing or ranking binary options websites may have been paid to promote or criticize particular websites. Fraudsters may “warn” you that the binary options website you are using is a scam in order to gain your trust and get you to deposit even more money in another website that they also run. Unsolicited Offers. Unsolicited offers (you didn’t ask for it and don’t know the sender) to earn investment returns that seem too good to be true may be part of a fraudulent investment scheme. High Pressure Sales Tactics or Threats. Representatives of binary options websites may use high pressure sales tactics or even threats (for example, threatening to file a lien against your property) to swindle you. Identity Theft. Representatives of binary options websites may falsely claim that the government requires photocopies of your credit card, passport, driver’s license, utility bills, or other personal data. Protect yourself and safeguard your personal information. Constant Turnover of Representatives. Be skeptical if the names of the persons you are dealing with at a binary options website seem to change frequently or if you are told your former “broker” has been fired. Issues with Withdrawals. Representatives of binary options websites may use delay tactics to hold up your withdrawal request until it is too late for you to dispute the charge(s) with your credit card company. The Fair Credit Billing Act (FCBA) provides consumer protections if you are charged for goods and services you didn’t accept or that weren’t delivered as agreed, but you must send a letter disputing the charges that reaches the creditor within 60 days after the first bill with the error was mailed to you. Also, be skeptical if someone tries to convince you to pay more money for a “premium” account with fewer restrictions on withdrawals. Credit Card Abuse. If you used a credit card to fund your account, keep an eye out for unauthorized charges on your credit card statements. Even if you signed a form purportedly waiving your right to dispute any credit card charges, report all unauthorized charges to your credit card company immediately. Government Impersonators. If someone claiming to be affiliated with the SEC contacts you and asks you to pay money to help you recover binary options investment-related losses, submit a complant at www.sec.gov/oig to the SEC’s Office of Inspector General (OIG) or call the OIG’s toll-free hotline at (833) SEC-OIG1 (732-6441). It’s important for all investors to know that the SEC never makes people pay to get their money back. Making material misrepresentations to investors (for example, overstating the average return on investment, overstating the long-term profitability of investing in binary options over the course of multiple trades, or understating the risk of binary options trading). Furthermore, if any of the products offered by binary options trading websites are security-based swaps, additional requirements will apply. 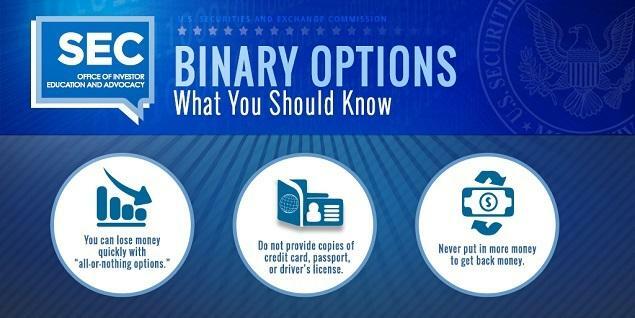 SEC Enforcement Actions Involving Binary Options. The SEC’s Division of Enforcement has brought charges against companies for failure to register the securities and failure to register with the SEC as a broker before offering and selling binary options to U.S. investors, as required. In SEC v. Banc de Binary, the binary options seller allegedly solicited U.S. investors through methods including YouTube videos, spam emails, and advertising on the Internet, and also communicated with U.S. investors by phone, email, and instant messenger. In In the Matter of EZTD Inc., another binary options seller allegedly misrepresented the risk of investing in binary options sold on its trading platforms, including by stating on its websites that investing in the binary options that it offered and sold is profitable when, in fact, less than 3% of its customers in the U.S. earned a profit trading binary options sold by the respondent. If you purchase binary options from a firm that is not registered with or subject to the oversight of the SEC, you may not have the full benefit of the safeguards of the federal securities laws that have been put in place to protect investors. Some safeguards and remedies are available only to purchasers of securities in registered offerings. In addition, individual investors may not be able to pursue, on their own, some remedies that are available for unregistered offerings. Before investing, check out the background, including registration or license status, of any firm or financial professional you are considering dealing with through the SEC’s Investment Adviser Public Disclosure (IAPD) database, available on Investor.gov, and the National Futures Association Background Affiliation Status Information Center’s BASIC Search. If you cannot verify that they are registered, don’t trade with them, don’t give them any money, and don’t share your personal information with them. Report possible securities fraud to the SEC. Ask a question or report a problem concerning your investments, your investment account or a financial professional. Visit Investor.gov, the SEC's website for individual investors. Receive Investor Alerts and Bulletins from the Office of Investor Education and Advocacy (OIEA) by email or RSS feed. Follow OIEA on Twitter @SEC_Investor_Ed. Like OIEA on Facebook at facebook.com/secinvestoreducation.